The Solaris 37’, as big as a 38 ft from other boatyards, is currently the only yacht on the market considered to offer a couple the same comfort as a 45 ft, thanks to the wide owner’s cabin, fitted with a central double berth and to the bathroom with a completely separate shower. The very clean deck is characterized by flush hatches, halyards and sheets concealed below deck and outboard chainplates. All these solutions facilitate moving on board in total comfort and safety, leaving large spaces for relaxation. The 37’, despite being the smallest boat in the Solaris range, is also built in accordance with the strict standard rules of the Maxi Ocean Yachts. With the introduction of this model Solaris becomes the only high quality yard to offer the market this size of yacht with the same technical/structural solutions, performance, safety and materials typical of the other successful bigger yachts of its range. 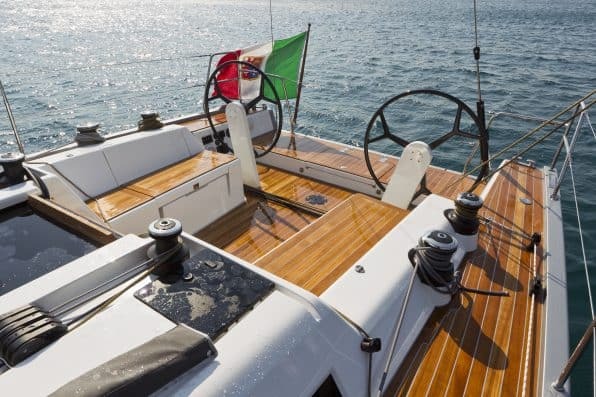 The 37’, like all other Solaris, features a unique structural characteristic: all the bulkheads, as well as the joinery, are laminated not only to the hull, but also and most importantly of all to the deck; in this way there is no need for inner mouldings and silicone bonding. The Solaris 37’ is designed to be easily handled and controlled by a couple or by a reduced crew. A cruiser-racer yacht, based on ORC rules, designed by Soto Acebal and conceived for the most demanding owners in search of performance, construction quality and seaworthiness. More information on the solaris 37 can be found here.